There are plenty of things to worry about when conducting a prescribed fire. Is the wind going to change? Is the smoke going where it’s supposed to? Will the fire leave sufficient unburned refuges for insects and other animals? Fortunately, one thing we don’t have to worry about is whether or not the smoke from our fires is contributing to global warming. It’s true that smoke from prairie fires contains carbon, and that carbon is lifted right into the air. However, it’s important to step back and look at the bigger picture. When all is said and done, the smoke from a prairie fire returns much less carbon to the atmosphere than was sequested during the same time period. 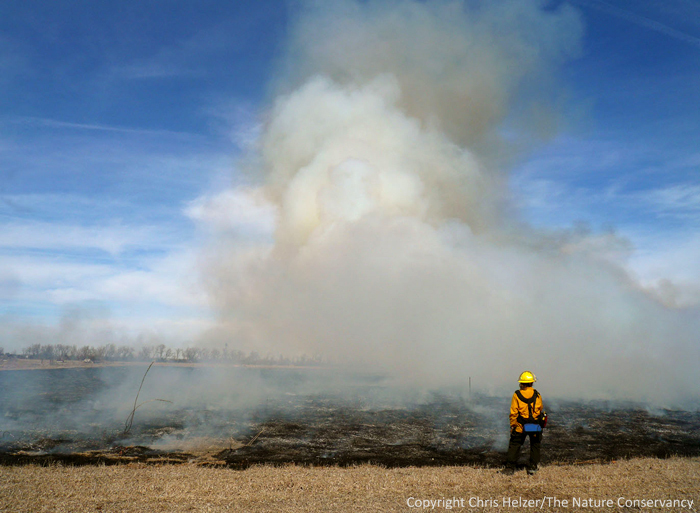 Even with annual burning, a prairie stores more carbon than it releases. First, prairies pull more carbon from the ecosystem each year than they release – even if they’re burned annually. Prairie plants take carbon from their environment and store it beneath the ground as soil organic carbon. We’ve long known that prairies build organic soils – that’s why grasslands make such good farmland – but recently that ability has gotten more notice because of its contribution to carbon sequestration efforts. Second, burning prairies stimulates stronger vegetative growth, which sequesters even more carbon in the soil than if the prairie was unburned. Spring fires warm the soil and allow prairie plants to start their growth earlier, and removes shade that would otherwise slow plant growth. In addition, it appears that fires also stimulate soil bacteria that make more nitrogen available to plants. Third, the carbon that IS released through smoke is not the fossil carbon that is responsible for steeply climbing carbon dioxide levels in the atmosphere. Smoke from prairie fires contains carbon that was pulled out of the atmosphere within the last few years. Remembering that much of that carbon is sent down in the the soil by prairie plants, whatever is re-released is simply returning carbon that was already in modern day circulation. Today’s increasing atmospheric carbon levels are driven by the release of fossil carbon from millions of years ago. That carbon was stored away in coal and oil deposits until we pulled it out of the ground and released it through combustion. So – stop worrying about carbon. Instead, make sure the forecast is still accurate, watch where your smoke is going, and be sure to leave some unburned areas for insects and other animals. This entry was posted in General, Prairie Management, Prairie Natural History and tagged carbon in prairie smoke, carbon sequestration, climate change, global warming, prairie fire and carbon by Chris Helzer. Bookmark the permalink. In addition to what you stated in your post, if prairies weren’t burned nearly all of the aboveground biomass would either be eaten or decomposed (decomposition being a different way of being eaten) and the carbon in that aboveground biomass would simply continue cycling. A lot of the carbon that cycled from the plant biomass to the consuming organisms would then cycle from the consumers to the atmosphere via the process of respiration by the consumers. Viola, carbon in the atmosphere even though the prairie wasn’t burned! Whatever carbon that cycled from the plant biomass to the consumers and was retained as consumer biomass would eventually cycle through another consumer/decomposer, which would then respire themselves. Further, smoke particles aloft block sunlight, resulting in a slight cooling effect. Indeed, the effect is not at all slight, when particulates from all the world’s fires are considered. To at least some extent, yes, but it gets more complicated, and I don’t pretend to know the details. Low intensity fires in woodlands that don’t affect the large trees are likely carbon neutral (or better) for the same reasons that grassland fires are. But fires that consume large trees release a lot more carbon because trees store a lot of carbon aboveground relative to grasslands. But even so, it’s carbon from the last 100-300 years (mostly) so it’s not like million-year-old carbon. Check other sources on this, though – I’m speaking from the edge of my knowledge. Dennis – my gut instinct in reply to your question is to say that similar claims could be made for any ecosystem. If the above ground biomass that would have been burned is instead left to be consumed/decompose then yes, the carbon in that biomass will eventually cycle back to the atmosphere. The rate of cycling in the no-burn scenario will be somewhat slower than in the burn scenario, but both rates of cycling are super-duper-, incredibly-, hyper-, fantastically-, mega-faster than the rate of cycling that is involved when we start talking about carbon that is sequestered in fossil fuel deposits. Here’s an article that takes these counter-intuitive notions about GHG, global change, and wildland fires even farther. The gist of it is that when forests burn, charcoal is created, and charcoal is a substance that readily resists decay and thus represents long-term carbon sequestration (relative to the non-burn scenario where the tree biomass would instead decompose, thus allowing the carbon in the tree biomass to quickly cycle back into the atmosphere). Thomas H DeLuca, and Gregory H Aplet. 2008. Charcoal and carbon storage in forest soils of the Rocky Mountain West. Frontiers in Ecology and the Environment 6: 18–24. Charcoal represents a super-passive form of carbon (C) that is generated during fire events and is one of the few legacies of fire recorded in the soil profile; however, the importance of this material as a form of C storage has received only limited scientific attention. Here, we review the formation of charcoal in temperate and boreal forest ecosystems, discuss some of its desirable properties, and estimate the potential contribution of charcoal to long-term C sequestration in forest ecosystems. Charcoal deposition over the course of several millennia probably accounts for a substantial proportion of the total soil C pool in fire-maintained forest ecosystems. Forest management processes that interfere with natural fire processes eliminate the formation of this passive form of C. We recommend that charcoal be considered in C storage budgets and modeling of forest ecosystems, especially in light of climate change and increasing occurrence of wildfire. This is off topic but related? Your thoughts and research on how much unburned refuge to leave for insects? In small remnants, 10 ac or less is this even feasible? I know they’re there even though I can’t name them or know if threatened or endangered. It’s a great question, and one that’s not possible to answer simply. The reason refuges are important is that there are a number of insects that are especially vulnerable to fire because they (eggs, adults, nymphs, or pupa) are in the vegetation when it burns. If an entire population of a species goes up in smoke it will need to recolonize from elsewhere. Insects (and other species) are just very vulnerable in small sites. Keeping that in mind while managing those sites is important. Defining specifics is difficult. Thanks Chris!! Lots of excellent comments and discussion. It seems logical that healthy and well-functioning ecosystems would be better at storing carbon.